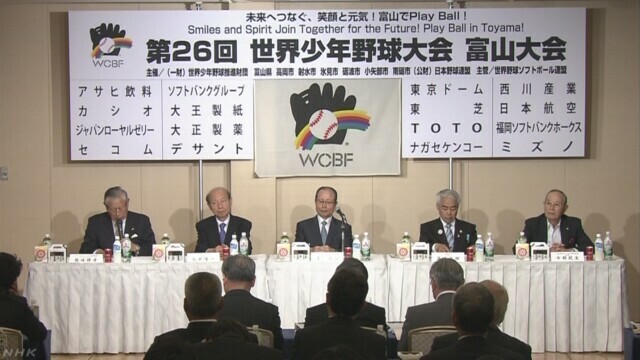 On June 20, 2016, Sadaharu Oh, 76, President of the World Children’s Baseball Foundation (WCBF) and former Tokyo Yomiuri Giants great who slugged 868 carrier home runs, in announcing the 26th WCBF in Toyama Prefecture for 9 days from August 17 to 25, hoped that this baseball event will set the stage for children to learn to take on challenges in life. With the backdrop of strong possibility that baseball and softball to be added to 2020 Tokyo Olympic, Commissioner Katsuhiko Kumazaki of Nippon Professional Baseball commented the event may offer a chance to the youth to play at the 2020 Olympic. For the first time in WCBF’s history, children from New Caledonia are invited to join baseball clinic along with Australia in Oceania Region. African Continent is represented by South Africa, Amecicas by Brazil, Canada and U.S.A., European Continent by Netherland, Poland and Russia, and Asian Region by China, Indonesia, Korea and the host Japan. Further, Children’s baseball teams from Chinese Taipei, Hong Kong and 12 regional teams in Toyama Prefecture will play international exchange games. The girls and boys 10-11 years old will learn from ten World Baseball Softball Confederation’s veteran coaches to play baseball and participate in cultural and other sport events to create goodwill and friendship. The ten WCBF nominated coaches are: Angel Bonilla (Head Coach､U.S.A. ), Yoshihisa Uchikawa (Co-head Coach､Japan), Frank Marcos (U.S.A.), Edgar Perez (Puerto Rico), Peter Caliendo (U.S.A.), Eugene Kingsale (Netherlands), Narelle Gosstray (Australia), Gerry LeBlanc (Canada), Daishin Nakamura （Japan） and Maki Ito (Japan).